It's really stirring people up, and seems the meat the Lamestream Media was looking for as coverage starts leaking out around the edges. You can watch on You Tube but a sign-in is required. If it doesn't show on this page, go here [Daily KOS], which has a secondary, slow-motion video of the spraying showing the women clearly non-violent. UPDATE: another video/angle has surfaced, showing what those women were "shouting about": look carefully and you will see a cop with his hands buried in a black woman's hair, twisting and pulling and wrenching. I'd be screaming too (and probably be maced). I dare anyone to watch these videos and justify the actions of NYPD in this situation. This is unconscionable. Much outrage across all independent media about this action. milk of magnesia, bandanas and vinegar, Milk of Magnesia, Bandanas, finger and leg splints, ice packs/cold packs, rubber gloves, cpr masks & swim goggles rated to 10m, water bottles with spray tops and big (#10) ziplock baggies to make kits. And "tobacco! We all smoke; we shouldn't but we do. Please send tobacco!" And tarps, bug repellent and calamine lotion, space blankets, gauze. And water; lots of water. Groundside folks: Record every badge number any & all officers you deal with. They must provide it if asked. Corollary: If any refuse to give you their badge number, photograph them for later identification. Boy, now that twitter has stopped blocking #occupywallstreet it's trending like crazy. Don't know if it's listed officially. The alternative media - Twitter, You Tube, blogs and social networks - are continuing to show strongly and demonstrate exactly why the net needs to be protected from such legal strategies as currently being pushed to "reign in," limit and control the channels of information by the media-government cartel. Protesters continue to use the "mass repeat" or "peer-to-peer networking" model to speak to the crowd after arrests for using bullhorn [against local regulations], as they do with Twitter and the You Tube videos; propagating the signal which is being degraded and establishing alternate nodes to transmit information. And I see more older people in the crowd feeds and photos; 40s-80s, including this little Grannys For Peace Brigade member being cuffed. The Guardian's been there almost from the start - props out. A lot of interesting agitprop media clippings showing up now on You Tube and Global Revolution; the artists are getting involved, including Charlie Chaplin's final speech from The Great Dictator. This pic gets tweeted frequently under the heading "NYPD sexually-assaulting female protester"
Some incredibly-moving and beautiful late-night interviews off the Global Revolution live feed, including "Mary," who came down as a middle-aged mother to support "the young people." Just lovely and ernest. Another released arrestee reports that a movie theatre on 12th Street took maced protesters in and helped them with bandanas soaked in vinegar, phone calls and first aid. Wonderful. Some plans are emerging to "get off the plastic and disposable cycle" through using plastic camping utensils. "...In addition to bicycle riding, camping gear and sleeping bags were now also banned." UPDATE/CLARIFICATION: Tarps are allowed; sleeping bags are allowed; just must not be hung from or attached to any structure/tree/sign. Funny about how most of the Lamestream Media stories are about arrests... and not about the issues. And of course, you aren't seeing the nasty videos there... luckily we have alternative sources, yes? You know, @WSJ the Wall Street Journal has been the one Major NYC newspaper covering #OccupyWallStreet, thank you. Give credit when its due. Thanks @CBS News #occupywallstreet Shoutout to CBS - their news van is following the police cars down Trinity. The biggest threat to our national security is thinking everything is a threat to our national security. 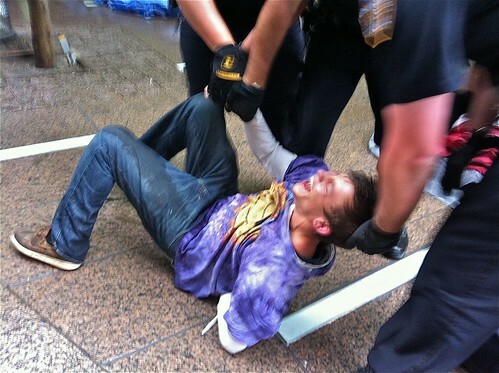 For me, the MSM not covering #occupywallstreet makes me wonder what else they aren't covering. 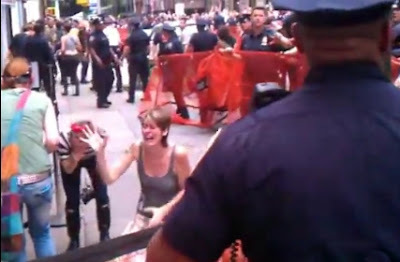 #BurgerKing has refused to serve paying customers who are activist in the #OccupyWallStreet movement. DO NOT GIVE THEM YOUR MONEY, BOYCOTT! just called abc australia an asked why no coverage, "oh! we haven't heard anything about it, thank you," hangs up. The 2003 protest against the Iraq War was the largest protest in history, and went uncovered by major media. Be heard. 10:45pmEDT - Tweets and now live stream indicating many protesters arrested earlier are being released and returning to the Square. We are unions, students, teachers, veterans, first responders, families, the unemployed & underemployed. Imagine if the #OccupyWallStreet protesters were carrying guns and threatening to use them, like the Tea Party? Quote of the day "It's not about left and right, it's about right and wrong." Love it. It's being acknowledged and recognized (at least by cooler heads) that "many, many" of the police are showing some sympathy with the positions being raised and the protestor's actions, especially because the protest has been peaceful. Doesn't mean that they won't go through the mechanism's motions because they are required to, but many of the police are not thugs (like some of these videos and photos show) and "this is not an action against the police." Who Watches the Watchmen? WE DO.